We only walked .7 mile on the Rim Trail yesterday, but we spent all day doing it. 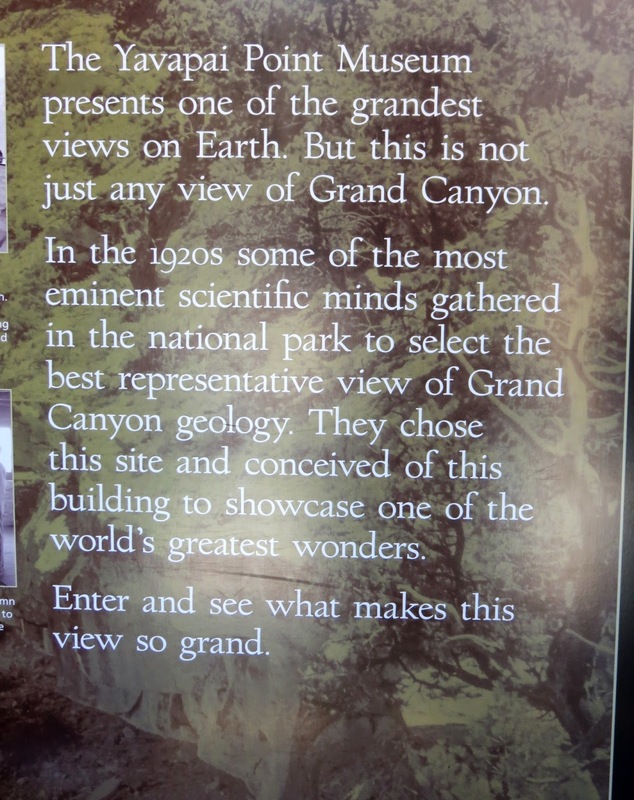 Our route was from Mather Point by the Visitor Center to Yavapai Point and Geology Museum. There was a lot to see and watch, and I was too tired to post the blog last night. Behind the Visitor Center is this large circle representing all the Indian groups that have lived at the Grand Canyon. Mather Point is one of the most visited view points, and so it was crowded. we had to wait our turn to photograph the view. Teo ravens perched on Mather Point. We still haven't seen a Condor. 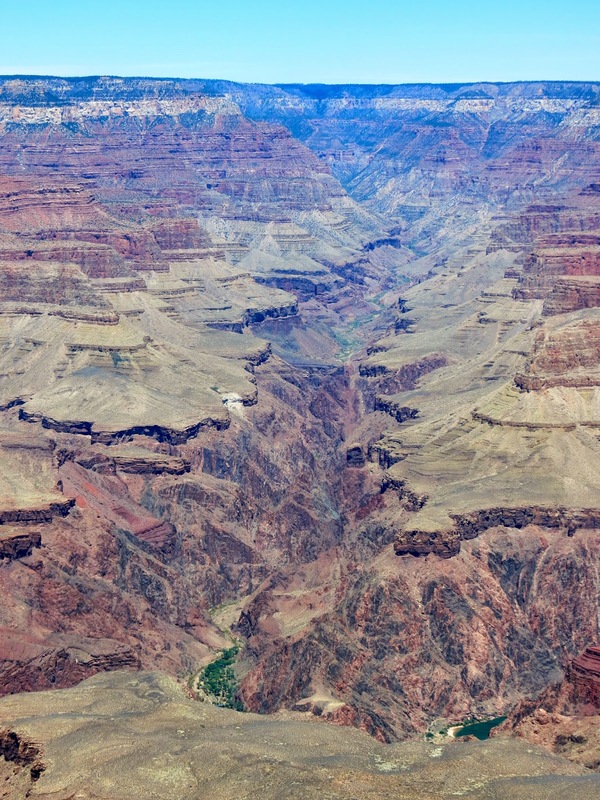 View of the canyon wall from Mather Point. You can see part of the South Kaibab Trail zigzagging down the cliffs. The trail leads to the river and Phantom Ranch. It is used by hikers and mules. For a shorter, more moderate hike, you can go 1.8 miles down the trail to Ooh Aah Point, with an elevation change of just 760 feet. We were considering this, but right now I am nursing a back strain, so giving it time to heal. Another view from Mather Point. Really? Someone threw a frisbee over the canyon? We can see Phantom Ranch from here. 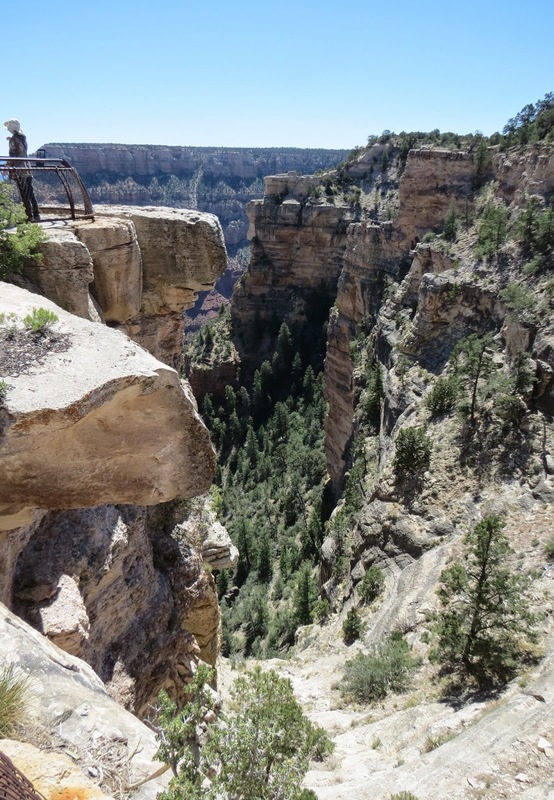 It's where hikers and mule riders spend the night in the canyon. We can also see another trail...Bright Angel Trail that leads to the river and the ranch. The trail follows that curve of trees partway down the slope. A creek provides water for those trees. Oh, here come the mule riders up from the Ranch on South Kaibab Trail. We lingered to follow their progress. Out of sight behind the formation at the right. While waiting for the mules to reappear, we watched some hikers climbing the switchbacks. The hikers must have started out before the mules. The mules reappear at Cedar Ridge, 3 miles from the top. It is one of two resting areas we could see along the trail. There are toilets and water available. We sat on a log and had a snack while we waited for them to rest. In this photo you can see the rest stop on the left and the start of the switchbacks on the right. An overview of the upper 3 miles of the trail. The rest area is about where the dead tree branch intersects the ridge. We counted 11 mules and riders. At least 1 would be a guide, so I guess they allow 10 in a group. We watched them until they disappeared from sight. The squirrels that hang out along the rim are called Rock Squirrels. They have no fear of people and draw a lot of attention. It amazes me how many people venture out on the edge for a photo op like this. I no longer have any desire to do this. Blessed are the risk-takers, for they shall see God...maybe sooner than they thought. The guys seem to be more daring than the gals. Even dogs get their photo ops on the edge. Approaching Yavapai Point and the Geology Museum. Bright Angel Canyon. At the other end on the rim at left, the North Rim Lodge is visible. It helps to have a zoom lens or binoculars. 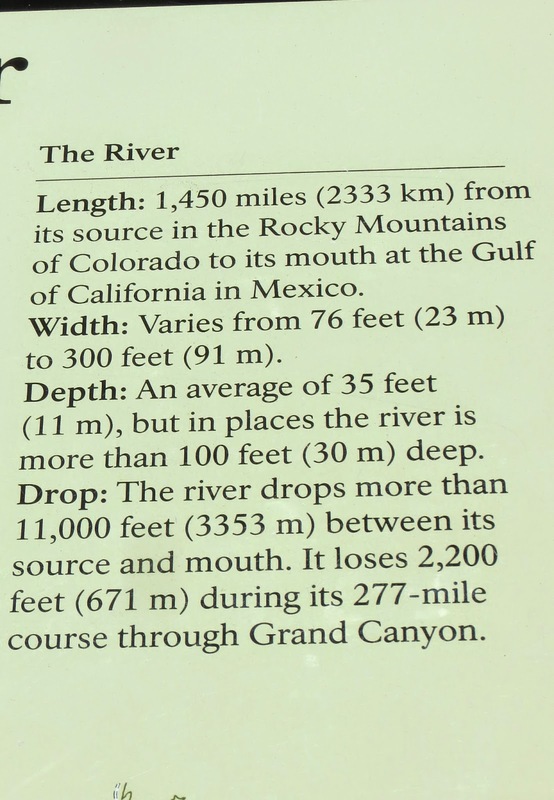 This diagram shows points along the river that can be seen from here. If you look carefully you can see those points: River at the base of Bright Angel Trail on the left, Phantom Ranch in the middle green area, and river at the base of South Kaibab Trail on the far right. Bright Angel Trail crosses Sumner Butte, then descends to the river. Do you see the mules on the trail? 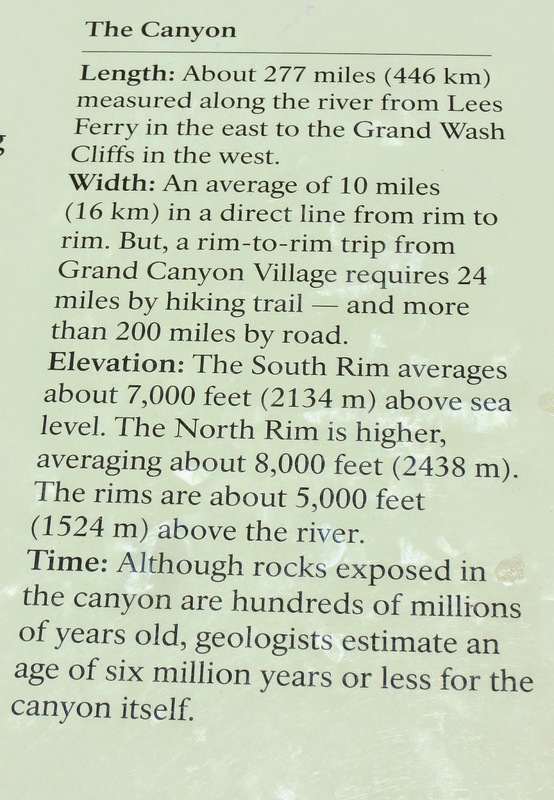 So I'm guessing the mule trip goes down into the canyon on Bright Angel Trail and returns to the Rim on South Kaibab Trail. Phantom Ranch on the left and the river at the base of South Kaibab Trail on the right. Rafters coming down the river. They probably spend the night at the Ranch too. Yes, that's a bridge...Kaibab Suspension Bridge is 440 feet long and used by hikers and mules. We ate lunch outside the museum near the resting elk. Others enjoyed the view closer to the edge. THe rest of our day was spent inside the Geology Museum. It was built in 1925. If you're not interested in geology, you can scroll through this part. There are gaps...millions of years worth that have eroded away. Today I bought a video of the mule trip to tide me over until I can do it myself. Some of the footage is taken from the perspective of the rider. What a fantastic post.....you outdid yourself. Amazing views, thank goodness you and Birdie don't feel the need to hang out near the edge. Crazy!